For some reason the action felt light this week but actually quite a lot happens and/or is revealed. In Camelot of the Way Way Past (even more past than last week’s little Art & Gwen scene) Merlin summons the Dark One, who looks like a Death Eater, and attempts to kill him but can’t cuz he’s too heartbroken. And/or knows he would then become the Dark One and doesn’t want to? I don’t know what all is going on here except that I suddenly understand why Merlin is a tree — assuming his lost love is Nimue the dryad. Anyways, the Dark One uses Merlin’s tear to cast the spell that transforms him into the tree we’ve met previously. 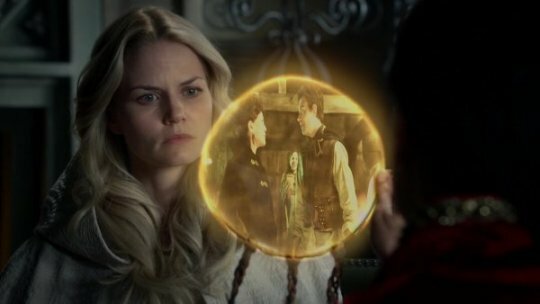 The camera pulls back to reveal Emma, in Camelot of the Recent Past, watching the scene through a dreamcatcher. Question! 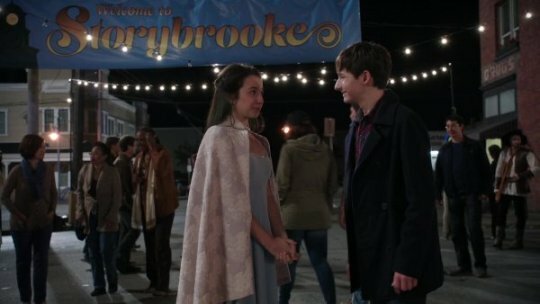 The current Storybrooke curse transforms people into trees when they cross the town line — is it possible Emma didn’t cast the curse? Is it a protection spell? Or did she learn it from this vision and … no but I don’t get why Emma would choose this particular curse? Maybe it’s cast when she and Merlin try (fail) to get rid of her Darkness? Still in Camelot of the Recent Past bewitched Snowing want to give the Dagger to Arthur because they trust him implicitly but Regina resists because she (rightly) doesn’t think David knows what that word means. The more desperate Snow and Charming appear, the more wary Regina becomes but the point is moot because Emma freezes her parents in place. Regina warns her to stop using so much Dark Magic and Emma shrugs. I’m reminded of the relationship between Emma and Mary Margarent in season one and the relationship between Emma and Hook in season four — but maybe I read too much into Emma’s shrugging. Regina thinks Emma should take her advice more seriously because she knows how hard it is to fight the darkness inside. Emma shrugs that off too saying “I’m not you.” Ouch. In Storybrooke of the Present, the crew have discovered the knight King Arthur poisoned and magicked away has disappeared. Arthur: He must have lied about having the bean. Snow: I feel like we would have noticed a giant beanstalk? David: Maybe it was magic. Arthur: La la la, I know nothing. Guinevere: Our people are really upset and you should do something about it or they will probably riot. Henry: Let’s have a ball. Henry: No offense but you are really bad at courting. Like it took a year for my Mom to agree to a date. And Tinker Bell hates you. And Millah – is it weird that you’re dating my mom when my dad was kinda your stepson? Henry: Your life is like a bad soap opera. Henry: She hit you with a rock. What courting even happened? Henry: No one in this room should be giving dating tips to anyone. 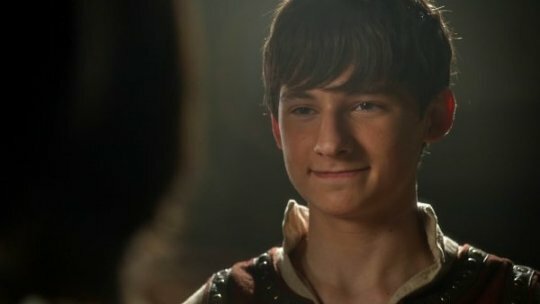 Henry: You used magic sand to win your wife back from your best friend because you ignored her for five years while you obsessed over fixing a sword instead of fixing your kingdom. And also you are shady af. 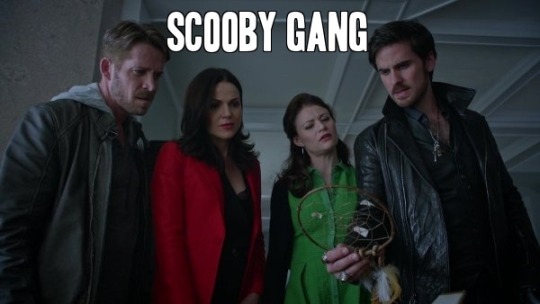 They agree to have a street fair and then Belle appears to tell them all Rumple’s missing. He is, of course, in Emma’s basement. They have a conversation that is basically Emma telling Rumple he has to be her hero and Rumple weep-laughing at the very idea. He asks what her plan is, she refuses to answer cuz he never let anybody in on his Dark One Plots. Rumple points out that everyone knew why he was doing it: to get his son back, and he still lost him. Emma shrugs and says she’s stronger than Rumple — so that’s two Darkened souls Emma thinks she’s better equipped than. Is arrogance her sin the way cowardice is Rumple’s, envy is Zelena’s, pride is Regina’s? Hmm. Anyway, Emma has had enough of this and hands him off to Merida. I love a lot that Merida stands up to Emma even without her heart. But Emma has full control over her nonetheless and sends them to the woods for hero lessons. Then she heads to her vault-shed of dreamcatchers and weeps. In Camelot of the Recent Past Emma tells Regina about Merlin’s tear casting the spell and Regina concludes they can reverse it with a similar tear-of-lost-love. So all they need is to break someone’s heart. Cue scene of Henry and his stable girl. My heart is already breaking here. Henry and Violet bond over losing parents before they really got to know them and it’s a tiny bit soul crushing. Then her dad pops up and basically tells Henry to keep away from his little girl cuz he’s a bard in a land that needs warriors. In Storybrooke of the Present, it’s a missing horse that gets in the way of their burgeoning romance. Violet is too sad and worried about her horse to go to the block party Henry got the town to plan specifically so he could bring her. Not one to give up easily, he enlists Emma in a plot to find the horse and thus Violet’s happy ending, and maybe his in the form of first love’s kiss? In the woods, Merida’s hero training consists of berating Rumple while brandishing a sword. Merida: I need a better plan. In the Yellow Bug, Emma asks Henry about Violet and we learn his old school taste in music can be traced back to his father and in fact, Neal used the same song to woo Emma. That’s terribly sweet but you know what would be better? If we’d seen that scene on screen. In Camelot of the Recent Past, Emma and Regina come across a frustrated Henry determined to learn sword fighting and thus become worthy enough for Violet(’s father). Both Moms tell him to be himself and use his status as a “mysterious stranger from an exotic land” to impress the girl. Emma brings up Neal again (though notably no one has yet used his name) and Regina reminds him of how she fell for Daniel because he was different. Henry is encouraged and Regina realizes where they can get a tear — from her. Emma uses the dreamcatcher to reveal Regina’s memory of Daniel’s death. Watching Cora rip his heart out right in front of Regina, Emma is visibly moved. Regina cries on cue and Emma catches the tear before telling Regina she didn’t realize all she’d been through. “I don’t understand how a mother could do something like that,” says Emma which is a little odd considering Emma’s Complicated Feelings about parents. Regina answers “She thought it was for the best.” and sighs cuz she has Complicated Feelings of her own. I am getting a strong sense of foreshadowing. In Storybrooke of the Present, Regina, Robin, Hook and Belle break into Emma’s house using Henry’s scarf — the one that’s in promo photos so his signature look. Costuming is so interesting in this show. In Camelot of the Recent Past, Henry has invited Violet to Granny’s to show her how mysterious and exotic he is. This involves Pepsi, lasagna, and the ubiquitous Yaz. Also Harold and Maude which Really? That movie is older than me. And I have never seen it. I didn’t even know what it’s about but Google tells me it’s a dark romantic comedy about an eccentric age inappropriate couple who meet at a funeral? Henry, that is not ‘a date movie’! But turns out it doesn’t matter: once Violet figures out he’s courting her she tells his she’s just not that into him. I suddenly hate everything about this plot line on behalf of teen girls and boys everywhere. I hope I am jumping to conclusions and they aren’t really setting Henry up as a Nice Guy Nerd with a crush on a pretty girl who just wants to be friends because that is entirely her right and if I see anyone hating on her for it or using the word ‘friendzoned’ I will lose it even more than I am already losing it. In Storybrooke of the Present, Merida finds out how to bait Rumple (SIGH UGH BELLE IS NOT A PAWN FOR EVERYONE EVER TO PASS AROUND SUGH), Operation Cobra Redux find Violet’s horse, and Operation Sneak Into The Dark One’s House In Order to Find the Former Dark One find the sword in the stone instead. They figure out that it’s related to the Dagger and probably booby trapped and that Rumple had been there at some point. But before they can try anything Regina gets Henry’s text that Emma’s on her way back and they have to get. On the way out Hook notices a box, with a dreamcatcher he recognizes as (similar to) the one Baelfire gave her (note: Hook is the first one to say the name). Regina realizes that’s how Emma stole their memories and takes it with her to study. In Camelot of the Recent Past, Regina drops her tear into the potion she’s cooked up but it fizzles out. Emma posits Regina’s heart has healed and moved on to Robin so it wasn’t strong enough. Cue Henry, recently rejected by his first love. Emma and Regina coo sympathetically but assure him that his heartbreak has a higher purpose and grab his tear. King Arthur and a handful of random knights appear to arrest Regina for lying and Emma for being the Dark One but they are no match for Swan Queen. Regina distracts the Camelotians with her signature fire spell and Emma completes the undo spell with Henry’s tear. A whirling swirling mix of Light and Dark Magic surrounds Emma and then the tree and out pops Merlin. He greets Emma affably and Arthur with Much Disappointment. Arthur immediately attacks but Merlin is like, LOL you can’t hurt me with a broken sword, loser. In Storybrooke of the Present, the carnival is in full swing. Hook and Snowing confront Arthur and Gwen about their general shadiness and I’m glad to see it. And Henry makes a truly Charming entrance on horseback. Violet swoons, Violet’s dad swoons, Henry gets a kiss on the cheek. Violet is dressed like Young Regina and it is ridic adorable and I see where this is going and CRY. Meanwhile in the woods, Merida taunts Rumple with the chipped teacup and it works. Rumple is willing to try to fight for Belle if not himself. Merida lets it slip that she has a different plan than Emma’s – she’s teaching Rumple not so he can pull the sword but so he can attack Emma. Merida’s a schemer and I like it. Robin and Regina apparently opted out of the street festival in order to study the dreamcatcher back at the Mayor’s house. It turns out to hold Violet’s memories – in particular that time Emma confronted her in the stable and ripped her heart out and ordered her to break Henry’s heart so she could use his tear in the potion. Regina is horrified and Henry, back just in time to see it, is devastated. So. Good news! The plot I worried about did not come to pass. Better news, this is a great plot for Henry/Jared. His witnessing Emma’s actions, in the dreamcatcher and in general over this season, is a very interesting analogy for growing up — learning that your parents make mistakes and wrong decisions and that the world is not made up of black and white/evil and good/dark and light. They made a point of having Henry express his age, I think it’s all purposeful. This is Henry’s ‘coming of age’ journey. 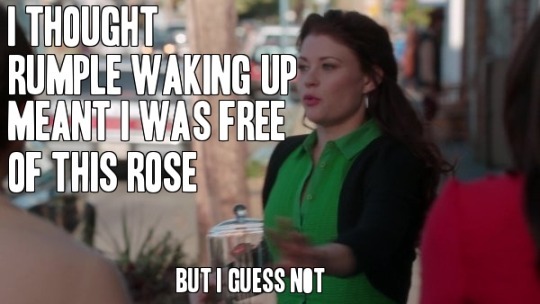 Bad news, Violet is the new Belle. And while I expect Henry, Regina, etc. to forgive Emma for her actions while the Dark One, Violet doesn’t need to forgive Emma for making her an unwilling and unwitting pawn TWICE. In Camelot of the Recent Past, everybody trots over to Granny’s where Merlin says yeah, sure, he can get rid Emma’s Darkness but she has to really, really want it. Emma squirms. Also adorable cinnamon roll Merlin vaguely accuses David of casual racism and it’s kinda great. In Storybrooke of the Present, Emma comes over to Regina’s cuz she’s lonely for her family but Regina will have none of it. They proceed to have a conversation we’ve heard before but the roles are reversed – and Regina knows it. Emma is rattled and lets slip that they set Merlin free while in Camelot. Regina wants to know what happened next but she has to wait til next week with the rest of us.